“The fact is that we are better together than we are apart. A family, a neighborhood, a church, or a country is more than just a collection of what each person brings to the group. Together, we enrich each other’s lives through our individual interests, gifts, and talents. And only when we live and work and play together can we become the kinds of healthy, balanced, purpose-filled people God created us to be.” My family challenges and inspires me to be the best I can be, for God and my world. I desire to do the same for them. Who Is My Neighbor? And Why Does He Need Me? is the third book in the series, What We Believe, published by Apologia Press with Summit Ministries. Who Is My Neighbor? And Why Does He Need Me? is beautifully bound in a hard cover book. It is an easy to read conversation, geared for students ages 6 – 14. You can find a Lesson 1 sample here. Who Is My Neighbor? is Scripturally sound, but not denominationally specific. It touches many subjects; teaching more than Bible. I believe the return on the $39 investment for the textbook, which includes access to additional resources and many online extras, has the possibility of being incalculable. 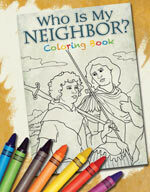 There is also a Notebooking Journal – $24, and a Coloring Book – $8, that corresponds to and reinforces each lesson. I have had the privilege of teaching Who Is God? And How Can I Know Him? and Who Am I? And What Am I Doing Here? , and we are now savoring Who Is My Neighbor? And Why Does He Need Me?. We continue to read, notebook, discuss and ponder, question, answer and memorize. I wholeheartedly endorse this worldview curriculum. It has been a joy to use such well-written, dependable material. There is a lesson plan outlined for each book in the series, but it is not mandated. In fact, each book is set up to allow maximum flexibility. We learn at our own pace. It is also noteworthy that each book is set up to stand on its own and must not necessarily build upon the previous one, although, there are keys that connect from one to the other. Personally, I appreciate the order designed by the authors, and I’m pleased we started with the first book. Who Is My Neighbor? And Why Does He Need Me? is a detailed 276 pages, comprised of 8 Lessons, each structured around The Big Idea – which is an intro to the main subject. I use the learning objectives for each lesson, laid out in What You Will Do, to guide our conversations and reinforce what we read. A Short Story is read and used to demonstrate a situation and how it might be handled when a Christian Worldview is in action. The stories contain marvelous detail, and although they can run long, my children anticipate each one! Vocabulary words are listed separately in Words You Need To Know. I have the children write these and their definitions, along with their Bible memory verses, from Hide It In Your Heart, first. We refer back to them as needed. There are various articles in each lesson, touching on subjects of art, music, math and science, etc., that tie into the main idea – either directly or through the short story. This is Integrated Learning. In a section titled What Should I Do?, a specific Godly character trait is highlighted. Combining Integrated Learning and What Should I Do? gives us the opportunity to brainstorm several scenarios and the best way to handle them. I use the Prayer section as a model, to keep our prayer time focused on the attributes of the lesson. 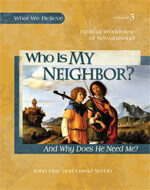 Thanks to Apologia Press, Worldview Study is no longer a dynamic I neglect in our Bible studies. In every lesson, we are given knowledge that helps us center our lives on God’s Truth, knowing what we believe and why. “When we recognize the components of our own worldview, we can begin to look at other worldviews and understand why others believe as they do.” As Christians, we have a hope in Christ Jesus, The One True and Living God, that other religions don’t have. Worldview equips us to effectively communicate that hope to others. Through all four books in this series, we are reminded that we are building a House of Truth. In this volume, Who Is My Neighbor?, we erect the third wall, the Servanthood Wall, adding on to the foundation and the first wall, the Fellowship Wall, built in Who Is God?, and the second wall, the Image-Bearing Wall, from Who Am I?. This is intended as a memory aid and can be drawn in the notebook, built with items you have on hand, or purchased separately from Summit Ministries, as a three-dimensional, build-as-you-go model. 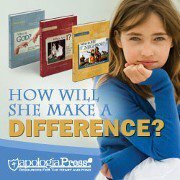 Please, use the numerous links I’ve provided in this post, to learn more about Apologia and their What We Believe series. You can read other reviews of Who Is My Neighbor? And Why Does He Need Me?, from my Crew mates, when you click the banner below. It is my hope that I have laid a firm foundation; built my house and home on Truth, and that my sons, as they travel to Quebec, Canada, this week, on a mission trip, to minister to the needs of our neighbors, will have assurance and full confidence in sharing their worldview. May The Lord keep them, and may they be “salt and light” for the cause of Christ. Disclaimer* A copy of this product was given to me, free of charge, in exchange for my honest review, as a member of the Schoolhouse Review Crew. I receive no other compensation for my reviews on this blog. The opinions expressed are my own.